Are you ready to hit the trail? You'll need to be prepared for how hiking on a natural trail is different from walking around the city or through parks in urban areas. Here are tips for beginner hikers. Hikers traditionally dress in layers so they can take off a layer after warming up and put it back on when they stop and cool down. You should carry a pack so you can stow your gear and carry enough water and snacks to get you through your hike. You will need to wear trail shoes for good traction, stability, and protection against rocks. Stream and river water is not safe to drink in most areas. That mountain stream that looks so pure can be a source of the Giardia parasite. Carry a water filter or water purification tablets if you plan to drink out of streams or springs. For a day hike, plan to carry enough water so you won't need to drink from natural sources. The first thing to realize is that you will be slower when you are hiking compared with walking or jogging on a pavement. 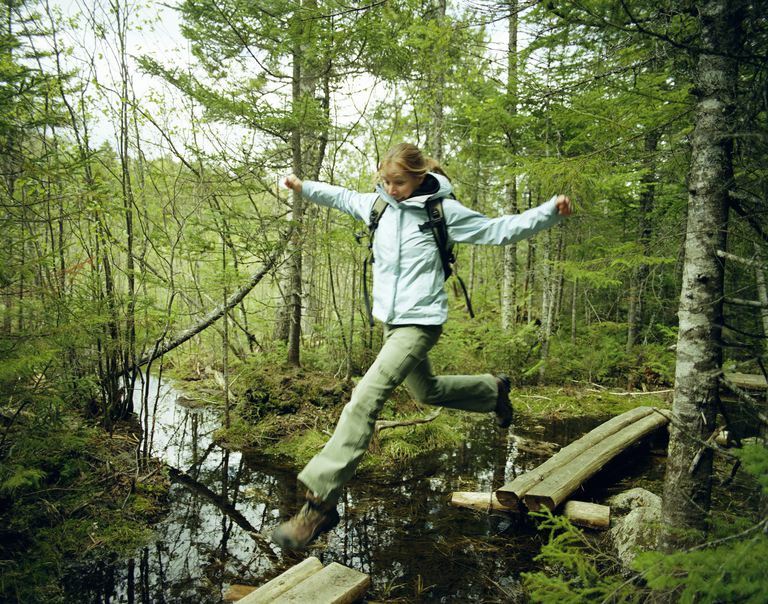 A natural trail requires more care in where you step. The surface is uneven and there can be rocks and roots to trip you up. Most maps and guidebooks give an estimate of how long it will take to complete a trail segment, and they may seem ridiculously long. They aren't. You'll want to plan for that much time. Even if you are speedy, you may want to take the extra time to appreciate the natural environment. Soak in the scenery, take photos, appreciate the birds, deer, and squirrels. Time in the woods, mountains, and deserts should be spent observing and enjoying rather than hurrying to a destination or through a workout. Hiking up and down hills and mountains requires care, especially on slopes covered with loose gravel or loose dirt. Keep your knees bent and use side-stepping maneuvers on the steepest parts. A hiking stick or a pair of hiking poles can give you an extra stability. Take your time, breathe, turn around and enjoy the views while catching your breath. The view from the top of a hill is worth savoring. Remember that you may have gained altitude where the air is thinner and has less oxygen. You may have to cross where there are no bridges or the bridges have not been replaced after seasonal floods. Rocks and debris in the river may seem like stepping stones, but can be slippery hazards. It can be wiser to move down to where the stream has fanned out and is shallow. If you cross at a narrow spot where the water is deeper and the current is swift, you can be swept you off your feet. Leave no trace — take only memories and leave only footprints. When nature calls and you need a restroom but there are none, remove yourself from the trail and away from any running water. Dig a trench at least six inches deep. Do your duty and bury it. Take all other trash out with you, including apple cores and other food waste. You may think an orange rind here or there is just compost, but most trails are used enough that if each hiker left one, they would smell like garbage dumps. A day out as a family is wonderful and makes memories. Use this as a chance to teach respect for nature rather than letting your kids or pets run wild. Don't let your child pick wildflowers, teach him or her to appreciate them in their natural settings. Some species, such as trilliums, will not bloom again for years if they are picked. Don't let your child throw rocks, rip branches from trees, or slide down slopes. This casual destruction can lead to erosion and the closing of trails. Dog owners may see this as a great time for Fido to run wild. The squirrels get enough exercise without his help, and having a beast charge around the corner of a narrow exposed trail is dangerous. Keep your dog under control and expect that there are other hikers, dogs, llamas, and horses on the trail who Fido might encounter. You don't need the sorrow of losing your dog in a fight when he is unleashed.